This month and next at Krab Jab Studio we are featuring the Art of Roleplaying Games show that I curated with Julie Baroh. We had a great opening the weekend before GenCon and now on Thursday night we are doing another event. This one is a meet the artists mixer and it’s happening on the eve of the Penny Arcade Expo here in Seattle. Many of the artists whose work is in the show will be there, and there will be beer, wine, and snacks. For more details, see the Facebook event page. Julie and I wrote curator’s statements for the show. For those of you who can’t make it down to Krab Jab, I thought I’d share mine here. From the beginning of published RPGs in the early 70s, art has played an important role. The words described the rules and evoked the worlds, but the art helped bring it all to life. I got into RPGs in 1979, when I was 10 years old. Certain pieces of art, like the cover of The Village of Hommlet and A Paladin in Hell in the AD&D Player’s Handbook, were burned into my brain forever. Later, I encountered artists whose work defined entire game lines, like P.D. Breeding-Black on Talislanta and Tony DiTerlizzi on Planescape. In the early 90s I started my career in the game industry as a freelance writer. At first I had no say in the art that accompanied my writing. Then in 1995, when I was working on a Warhammer Fantasy Roleplay book called Dying the Light for Hogshead Publishing, I got to write my first art order. It was exciting to conceive something in my mind and then see a talented artist interpret it in the final book. In my first company and then in the early days of Green Ronin Publishing, I had the chance to art direct many books and that was a new challenge. Not just writing the art orders, but recruiting artists and working with them to produce the final work gave me a true appreciation for the work that goes into a RPG book beyond the text. It also made me realize that while I could art direct a book, there were folks far better at it than I. That’s why I brought in Hal Mangold as a partner, and he has art directed and graphic designed almost every Green Ronin project for the last ten years. When I joined Krab Jab in 2011, I was just looking for a co-working space to do my writing. I loved the idea of working in a creative space instead of a soulless cubicle. I wasn’t thinking in terms on curating a show, but one day I suggested to Julie Baroh that a show focused on RPG art would be awesome and we decided to curate it together. As far as I know, no one has attempted a gallery show like this before. The response from the artists and the public has been tremendous and I’m thrilled with how the show came together. We’ve got work from 30 years ago to today and from a wide variety of artists. Here’s the thing though: this show only scratches the surface of what’s been done in RPGs in the past four decades. RPG art has rarely appeared in galleries but I think the skill and imagination on display here make it clear that it should. I hope you enjoy The Art of RPGs and get some of that inspiration I experienced as a 10 year old. Even more, I hope we get to do this again! I am co-curating and Green Ronin Publishing is sponsoring an art show at Krab Jab Studio called The Art of Roleplaying Games. The idea is to show off some of the awesome art that has been produced for RPGs in a gallery setting. We hope to display a breadth of material that represents RPGs from the early days to the present and feature art from a wide variety of games. The show opens on August 11, 2012 and runs through the first week in September. 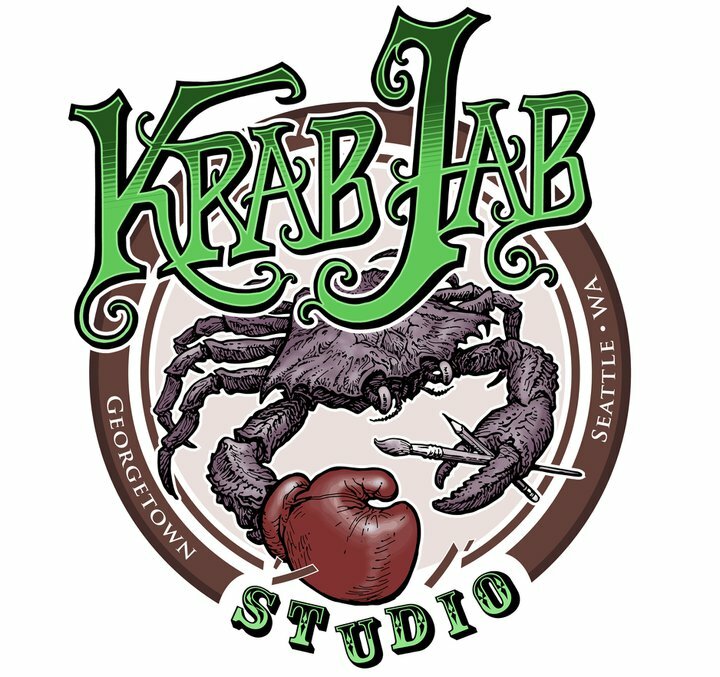 We’re planning a special event the night before the Penny Arcade Expo begins, and we hope we can lure some attendees away from downtown to check out the show and the Georgetown neighborhood where Krab Jab is located. We already have some art lined up but right now it’s mostly from local Seattle artists and we’d love to have participation from further afield. If you are an artist, collector, or company that owns original RPG art and you’d like to be part of the show, please contact us at krabjabstudio [at] gmail [dot] com. Let us know what you’d like to show and what game products they appeared in. Work can be any 2D media, color or grayscale, and must have been created for use in a roleplaying game publication. Krab Jab Studio does have an artist agreement that needs to be signed prior to hanging (it’s very standard legal stuff). Krab Jab Studio takes 20% commission for works sold inhouse or online, but you are not required to have your pieces for sale. We do catalog the show and list it on our website (www.krabjabstudio.com). By August we should be set to ship art within the US (we currently sell locally). Fully established by 2010, Krab Jab Studio is the workplace of artists Julie Baroh, Milo Duke, Mark Tedin and writer Chris Pramas. With a monthly rotation of guest artists in our gallery, Krab Jab has developed a steady following in the funky, industrial artist’s haven known as Seattle’s Georgetown neighborhood. Krab Jab Studio also facilitates classes and workshops, most of which are developed as further education in the illustrational arts. Mark and Julie run a successful weekly costume drawing group, bringing in costumes and models of all kinds. The name “Krab Jab” is a combination of initials of founders Julie Baroh and Kyle Abernethy. We found it to sound funny, and it stuck, even after Kyle left in 2011 (he still shows with us each month). Previous Krab Jab artists have included painters Michael Hoppe and Sandra Everingham. Green Ronin Publishing is a Seattle-based company known for its dedication to quality books and games. Founded in 2000, Green Ronin has been at the forefront of roleplaying game development ever since, taking home the coveted ENnie Award for Best Publisher an unprecedented three years running. With great licenses like Dragon Age and A Song of Ice and Fire, groundbreaking games like Mutants & Masterminds and Blue Rose, and a roster of top flight designers and illustrators, Green Ronin Publishing is a leading light in the hobby game industry. Personal Note: If you are wondering how I am both president of Green Ronin and a member of Krab Jab, see this older post. Short answer: I’m using Krab Jab as a co-working space.